This is the second book in what I hope is a three- or four-book series of mid-century modern architecture, written by Sam Lubell and photographed by Darren Bradley. The first book, Mid-Century Modern Architecture Travel Guide: West Coast USA, was published in 2016, two years before its East Coast sibling. 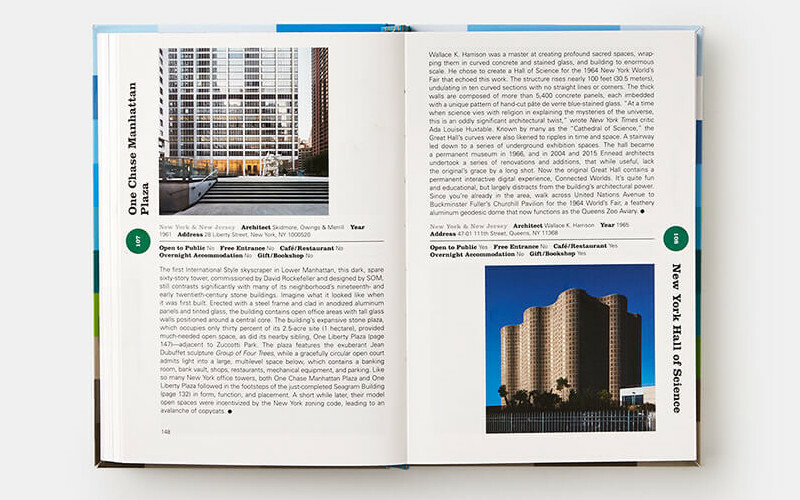 In my review of West Coast USA, I honed in on the design of the book, the chronology of the buildings included in it (ranging from 1921 to 1978), and the book's geographic structure. With the same players involved, including Phaidon, and a consistent format, the same could be said about East Coast USA (though the rectangles on the cover and chapter intros remind me of a John Ronan school rather than an album cover). 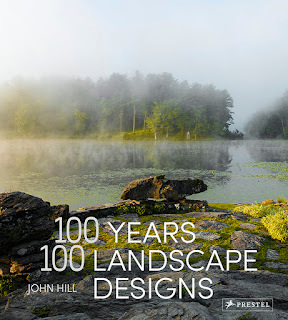 But given that I have lived on the East Coast for a dozen years, I'm more inclined here to focus on the content relative to buildings I've visited and the how successfully the book spurs me to visit places I haven't. East Coast USA has over 250 buildings in 5 color-coded geographic chapters: New England, New York & New Jersey, Mid-Atlantic, South, and Florida. 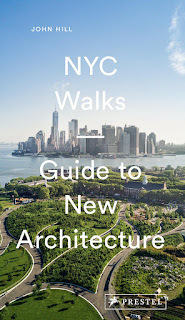 The place I'm most familiar with, New York City, has just over 30 buildings, ranging from a school in the Bronx by Marcel Breuer to the "new" TWA Hotel by Eero Saarinen at JFK. 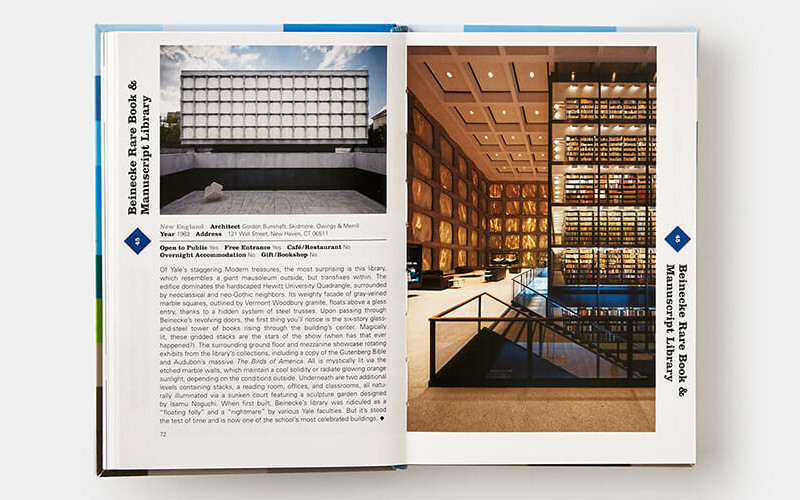 It's a solid selection that has obvious choices (Mies's Seagram Building) but also lesser known mid-century gems (William Berger's Tribeca Synagogue); the same could be said about the whole book. There are a few projects in Queens, the borough I call home, including the New York State Pavilion by Philip Johnson, which was built for the 1964 World's Fair, has languished as a ruin but has gotten attention by preservationists in recent years. Curioiusly, the book's accessibility data indicates it is open to the public and has a free entrance; visitors can walk around the structure (it sits in a large park) but cannot get inside it. I'm not highlighting this here to point out an error – it's not really an error, given that it's not private and doesn't require admission. Rather, those points of data are not always so black and white as "yes" and "no," and readers should be wary of starting a road trip only to find that this or that building is only partially visible or accessible. Lubell's text does refer to the accessibility and visibility of buildings, particularly single-family houses, in the introduction. Likewise, the book includes a helpful section with visitor information at the back of the book, something people should use before they grab this book and hit the road. Where would I most want to go with this book? To name just a couple things near NYC, there are churches by Victor Lundy and others in Connecticut, while farther north of the city are the numerous Kahn buildings I've yet to see in person. 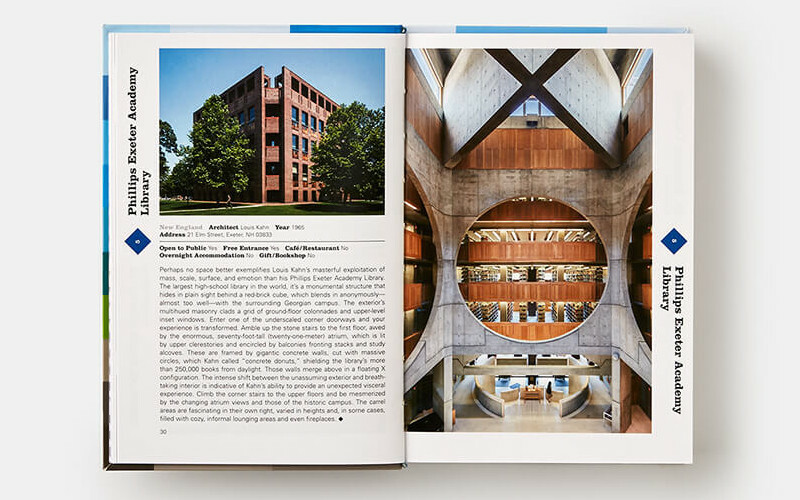 While I wouldn't need this guide to know about or plan a visit to, for instance, Kahn's Exeter Library, the inclusion of lesser known buildings in its pages means I would see some other interesting buildings on the way. I'd also use East Coast USA to navigate parts of Florida, the state my parents have called home just about as long as I've called NYC home. The last chapter has nearly 50 buildings there, clustered in Jacksonville, Orlando, Sarasota, and Miami. I've remained ignorant to modern architecture in Florida over the years, so Lubell and Bradley's book is perfect for me. It highlights buildings by Frank Lloyd Wright, Paul Rudolph, and Victor Lundy, but also a whole lot of obscure stuff – buildings that express the state's distinctive strand of mid-century modernism. Therein lies the appeal of the books in this series: its mix of familiar buildings by famous names and quirky buildings (Tiki anyone?) by forgotten architects captures the nuances of the period and makes the argument for their continued use and preservation. 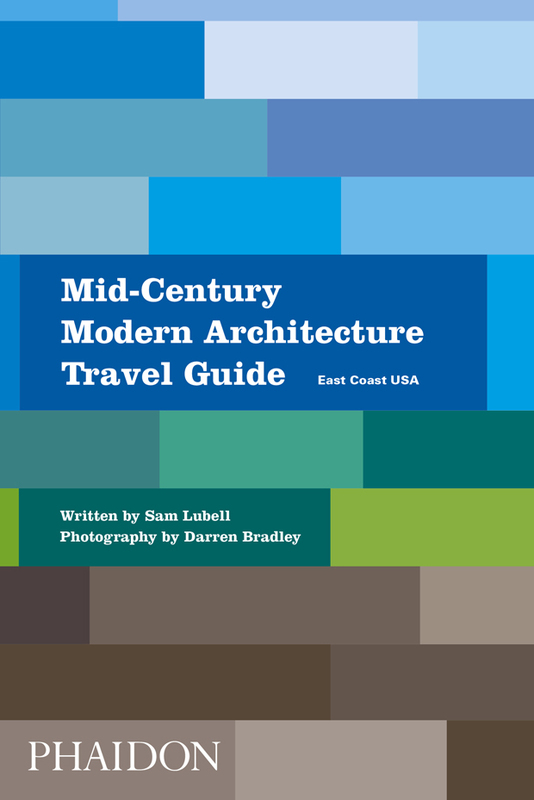 Sam Lubell has written eight books about architecture, including Mid-Century Modern Architecture Travel Guide: West Coast USA. He is a Contributing Editor at The Architect’s Newspaper and writes for The New York Times, Wallpaper, ... and other publications. Darren Bradley is a Southern California-based architectural photographer, active in the preservation of Mid-Century Modern architecture.